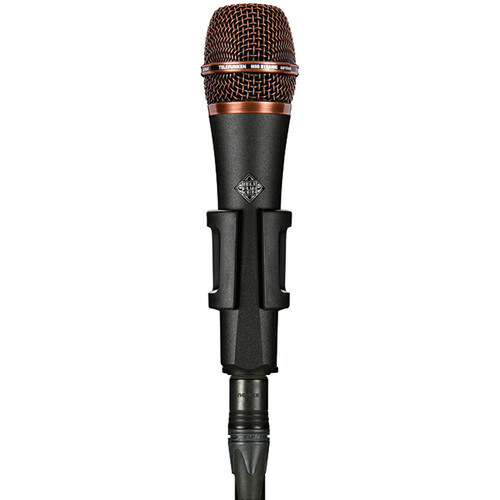 Presented in a black body with a copper grille, the Telefunken M80 Custom Handheld Supercardioid Dynamic Microphone delivers the sonic essence of a condenser in a rugged dynamic design. It features a wide 50 Hz to 18 kHz frequency response and high maximum SPL of 135 dB, making it equally suitable for voice, instruments, or drums onstage and in the studio. The M80 is designed to be an alternative to the midrange-laden character of most dynamic vocal microphones. The M80's low-mass capsule and super-thin capsule membrane allow a wider dynamic range from a live vocal, providing an intimate feel that's typically reserved for studio condenser microphones. The head and capsule assembly is designed to reduce proximity effect and add low-end clarity while still providing present bass. The M80 also features an American-made, custom-wound, impedance-matching transformer. It ships with a mic clip and leather storage bag.